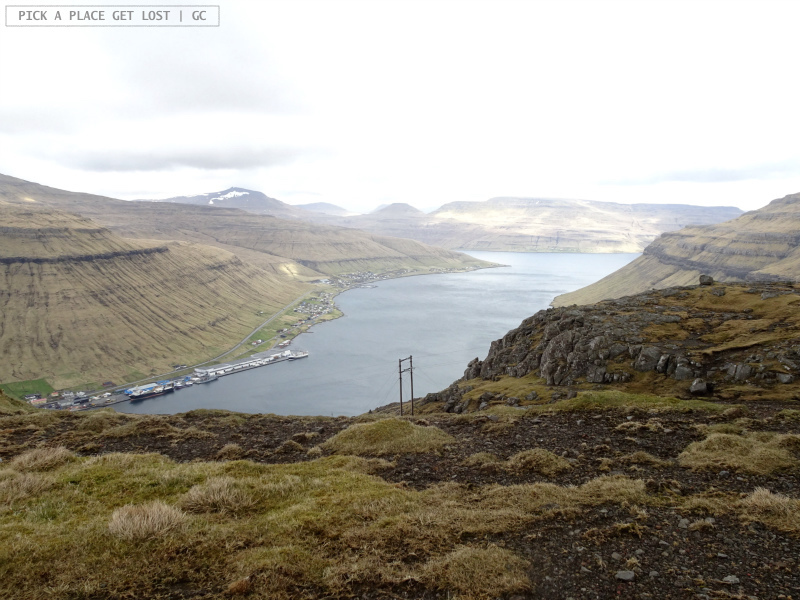 The way the Gjógv trip (pronounced /ʤɛgv/) came about, it was almost pure improvisation. We had a ‘shortlist’ of possible (half-)day trip options, but we couldn’t get our heads around it. The calendar was very helpful. We’d already booked a trip to Mykines for Wednesday and made rough plans for Tuesday, so it was either Monday or Thursday. The Gjógv trip was taking place every Monday. There you go, that’s how ‘the trip chose us’. 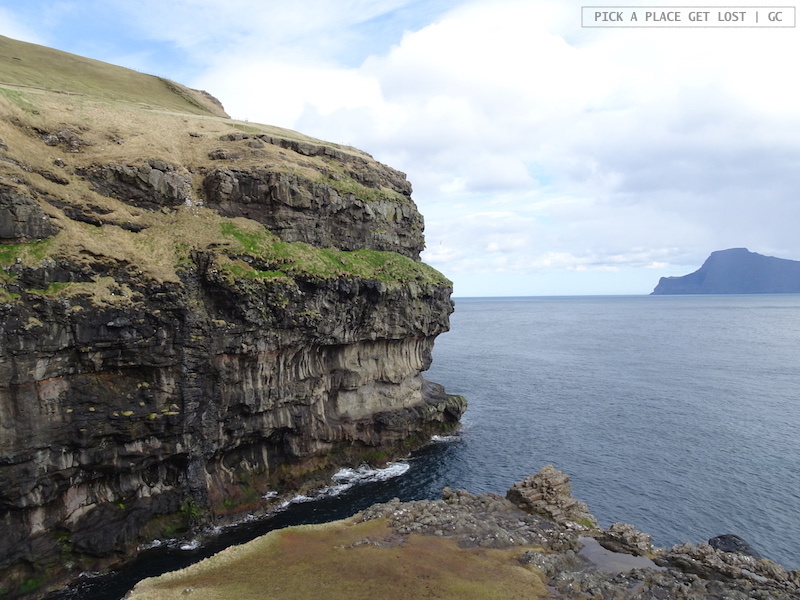 We booked with 62°N Travel*, one the of the most popular Faroese tourist agencies (see my ‘(Fun) Facts and Figures’ post for extra info and links!). The meeting time and place were the bus terminal in Tórshavn at 9 o’clock on Monday morning. We were landing on Vágar the night before, so, what with the rather tight plan we’d made, I was mildly worried that a last-minute schedule change or flight delay (or cancellation) might disrupt our journey. Thankfully, it didn’t happen, and on the Monday we boarded the earliest bus from Sandavágur to Tórshavn. Well before 9 o’clock were were sleepily strolling up and down the bus parking area in front of the bus terminal. We had no idea which kind of vehicle and/or guide(s?) would pick us up. Soon enough, a middle-aged man got out of a small van, approached us, and introduced himself as our guide. Then he approached another girl in the vicinity (also booked on the same tour), and we all hopped into the car. 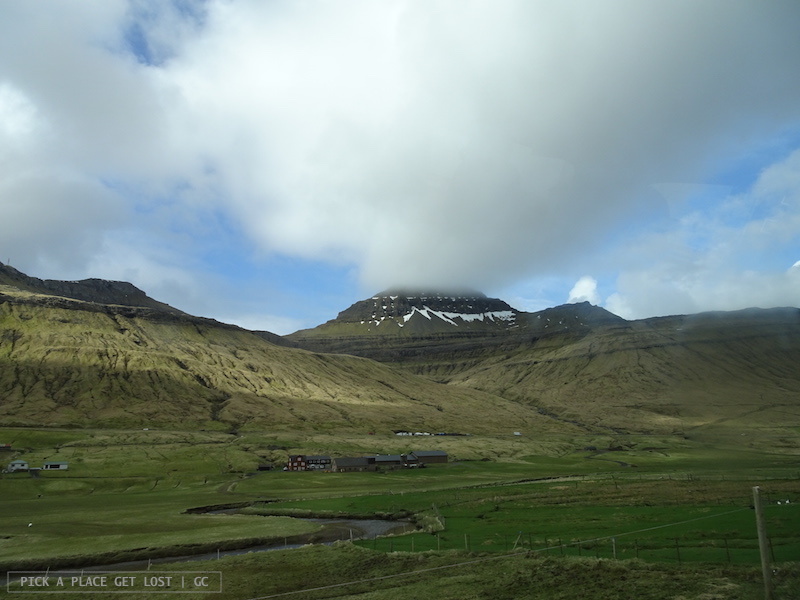 We basically drove straight to Gjógv, but had a good share of stops in strategic spots along the way, plus a huge amount of fun facts straight out of a local’s mouth. It was so interesting and super fun! Needless to say, the scenery was mesmerising all the way. I’m not even sure you can quite get lost while driving around the Faroes, as there almost seems to be only one road, which at some point turns into a bridge or (undersea) tunnel when it crosses through a mountain or the strait between two islands. But I’m digressing here. 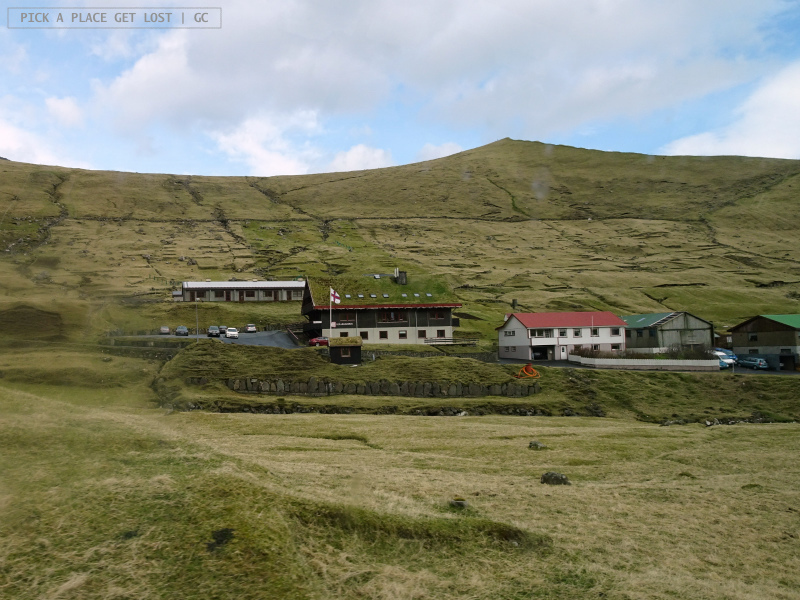 While still on Streymoy (the island of the capital), we saw the prison building (the only prison in the Faroes). It’s a large complex built on a mountain slope, at a considerable height, and it is home to eight inmates. The fact that all of them were convicted for minor offences has a twofold explanation. On the one hand, if more serious crimes are committed, the offender is sent off to a Danish prison. 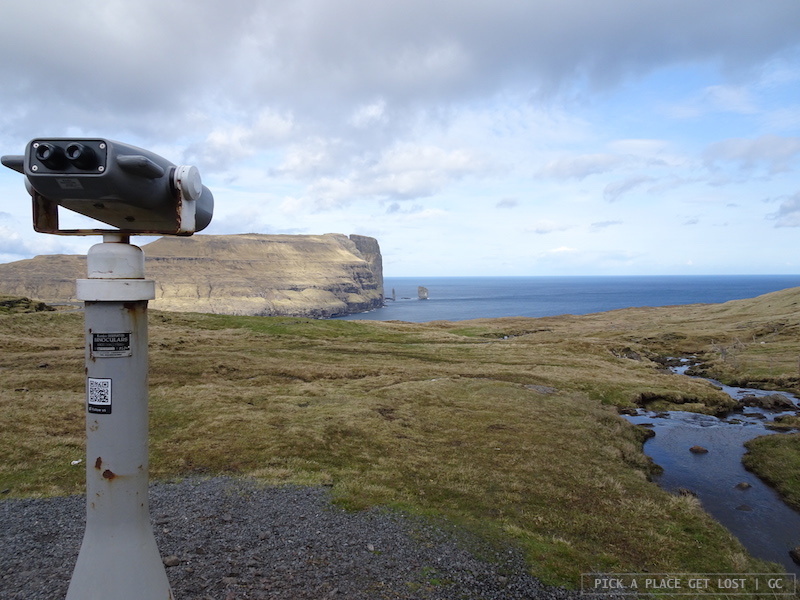 On the other hand, the crime rate is very low in the Faroes, so I’m not even sure they have that many felony cases up there. What can I say, the view from the prison building is truly stunning. Off the Streymoy coasts, as well as virtually any Faroese coast, you’re likely to notice ‘bunches’ of giant metal rings (say like between five and ten) on the water surface and, in the vicinity, a boat tied to the structure. They are fish-farming stations, enclosures in the form of seawater cages where fish (mostly salmon and trout) is raised in a controlled environment for commercial purposes. The fish are fed through special holes, and the food is ‘shot’ out of the belly of the boat. In fact, while we were sailing from Vestmanna to the bird cliffs, the captain pointed to a fish-farming complex, claiming that the nets might contain up to a few million fish. 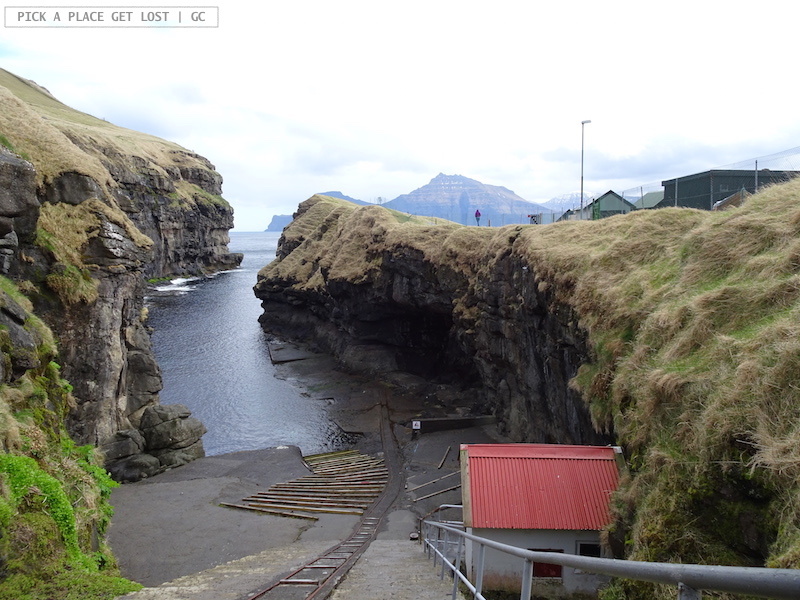 We drove past the former whaling station called Við Áir, the only one still standing out of seven whaling stations built by Norway on Faroese territory in the early 20th century. 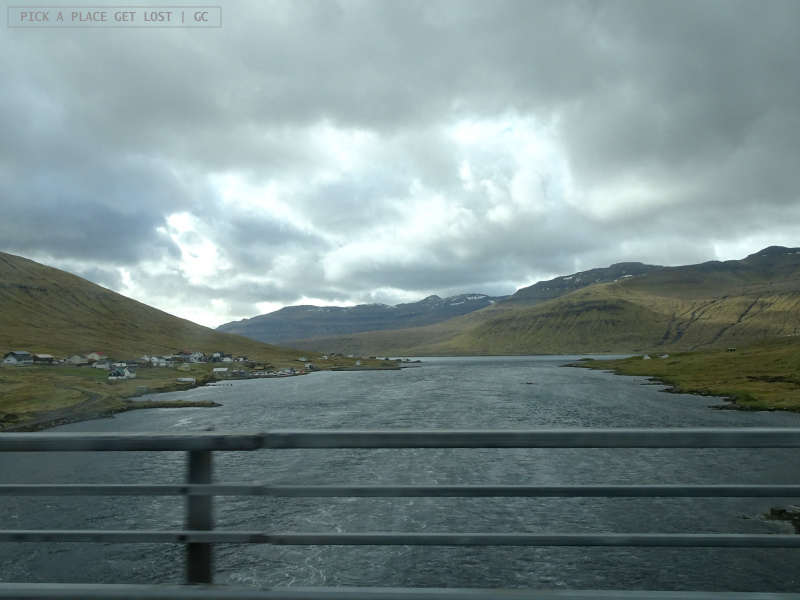 Soon after that, we crossed the bridge to Eysturoy and, immediately after that, we turned left to head north. A bit further on, we stopped again. The reason? Fossá Waterfall, which, once you actually see it, you also see why it was worth the extra stop. 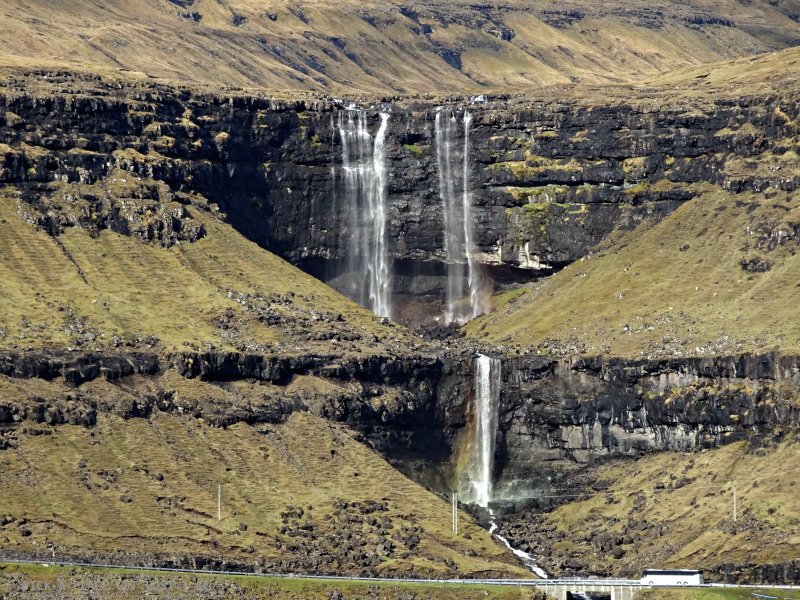 This multi-level, 140-metre waterfall is located near the village of Haldarsvík, on the northern coast of Streymoy. It is spectacular, to say the least. From across the Sundini sound (the strait between Streymoy and Eysturoy) the waterfall looks like a white vertical line drawn on a seemingly endless ‘wall’ of steep rocky slopes and cliffs. As I understand, you can hike up to the waterfall (at least up to a certain level). I can only imagine what stunning views one can enjoy from there. Not long after we got back into the car, we had to stop again. 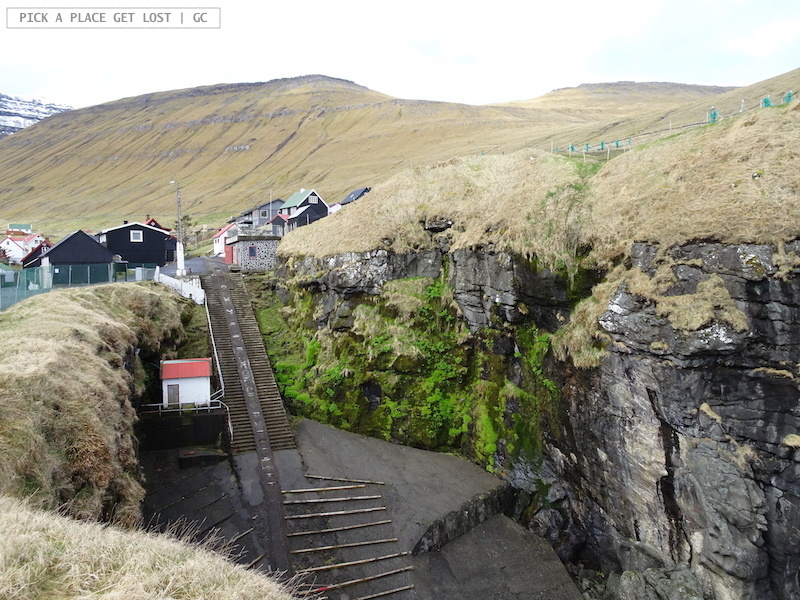 We were close to Eiði, a super lovely, super small fishing village on the western Eysturoy coast. From Eiði we also enjoyed a great view of the free-standing rocks known as Risin and Kellingin located just off the northern Eysturoy coast. 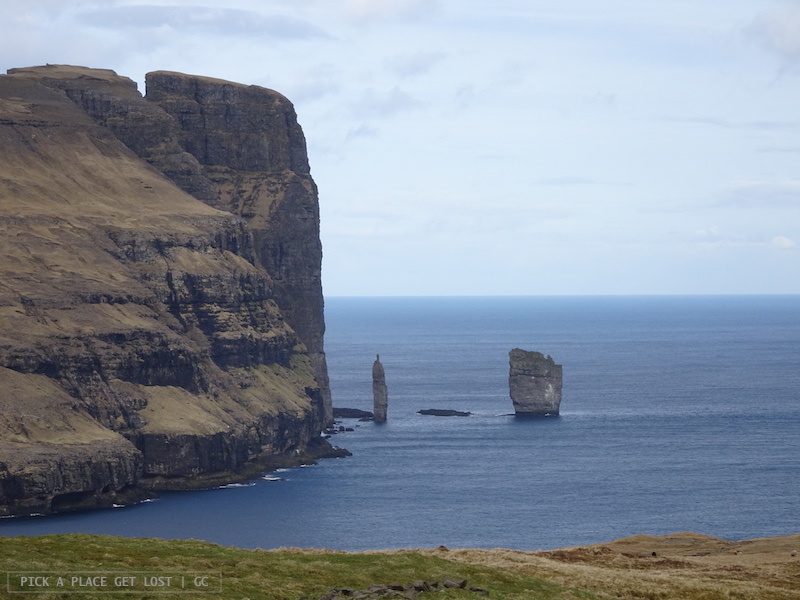 Risin and Kellingin are the giant and the witch (his wife) that had been sent to Faroe Islands from Iceland for a very specific reason: they had to give Faroes back to Iceland. They arrived on the Faroese coast around dusk, and tried to steal the islands by tying a rope around the mountain called Eiðiskollur, not far from Eiði. They kept trying all night, but to no avail. Except, they were so busy with their task that they also failed to notice the first rays of sunlight, which they had to avoid: because they were creatures of the night, the sunlight would turn them into stone. And turn them into stone it did. The two ‘standing’ rocks you see now off Eiðiskollur are the giant and the witch staring westward, hopelessly yearning for their country forever. 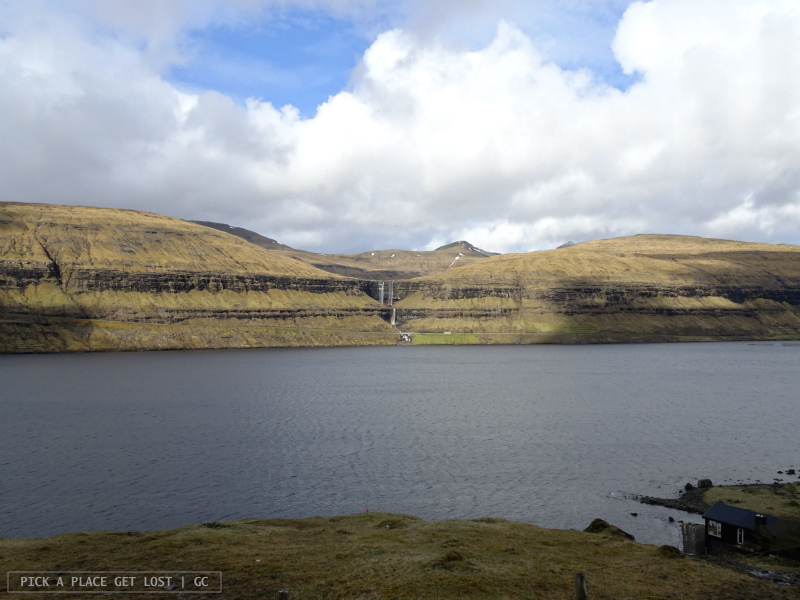 After we left Eiði, we drove past Slættaratindur, which, at 880 m above sea level, is the highest mountain in the Faroes. It is said that, on a clear day, from the top you can see all 18 islands, if not as far as Iceland (though this bit is rather controversial). Its layer-cake peak looks unmistakably stunning. If you’ve read about Slættaratindur, you will certainly have read that climbing to the top on 21 June to watch the sun set and then rise again a few hours later is a tradition. Such ‘fun fact’ was promptly validated by our guide, who, as we stood in awe before the mountain (and sought to immortalise it as best as we could), did mention how he and his friends have ‘this thing where we climb up there at midsummer night’. We had almost reached our final destination, when we came across a super steep hill slope and a road with hairpin turns winding down the slope. 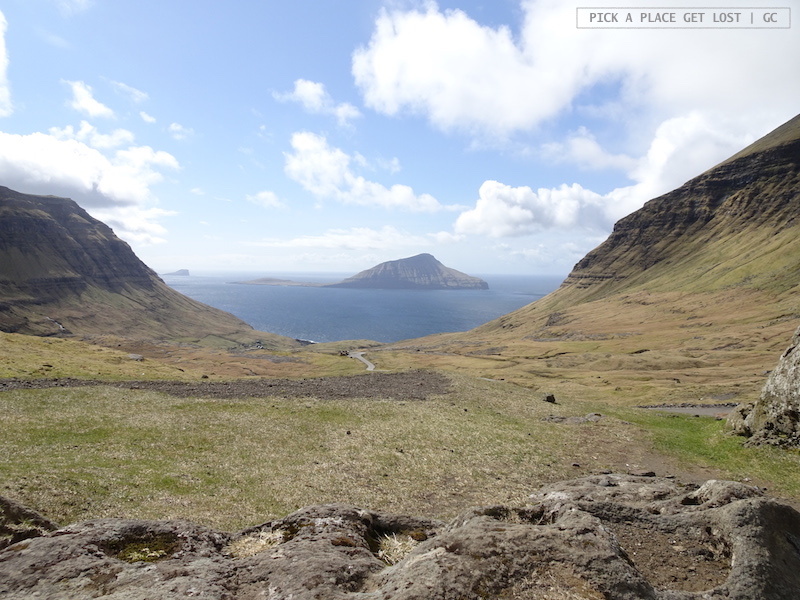 That was one of the most mesmerising views I saw during my (short) Faroese stay. 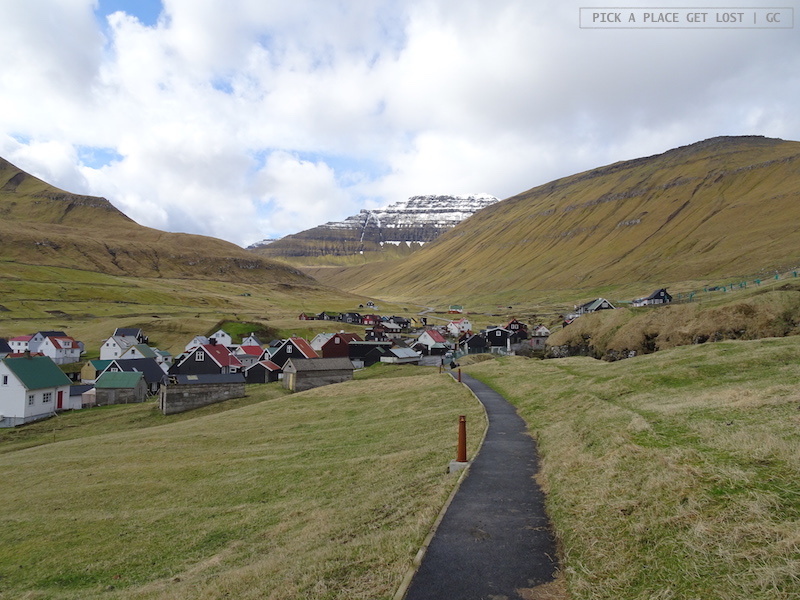 On our side we had the slope that led to the village of Funningur at its bottom. The village, very small and poorly connected by public transport, overlooks the fjord by the same name (Funningsfjørdur). Around us, only mountains: to our right still Eysturoy, and in front of us, in the distance, Kalsoy. It looked so close, yet so mysterious, deserted and remote. I am so genuinely fascinated by Kalsoy. Funningur is only 4 km from Gjógv, so at that point it didn’t take long to get there. By the time we did, though, the weather grew worse and worse. Our guide wisely predicted: ‘It will start raining shortly’, to which he promptly added: ‘It’s going to be a short shower, so we can go find shelter (and coffee) in the guesthouse, and then we’ll go see the gorge’. Needless to say, it did start raining right then, and it was a very brief shower. The ‘guesthouse’ is Gjáargarður Guesthouse, a wooden, turf-roofed building not far from the bay. Quaint and characteristic as it is, it makes for comfortable as well as truly Faroese accommodation experience. 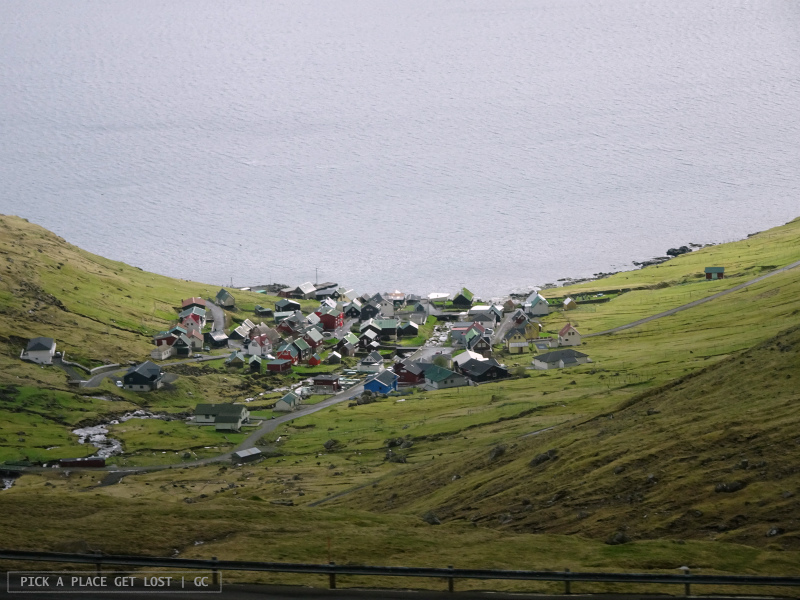 On the downside (it might be one for some), the guesthouse is rather isolated, so, unless you’re renting a car, it won’t be that easy to get around by public transport from and to Gjógv. 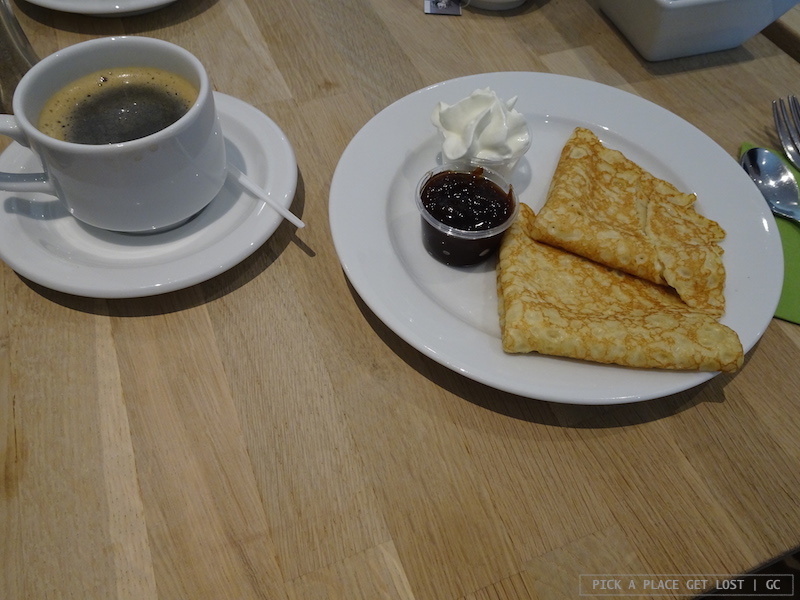 We headed straight to the guesthouse café, where we were treated to coffee and pancakes with cream and rhubarb jam (so good that the next day, when we saw it in the supermarket, we had to buy a jar). By the time we were done, we were ready to go. 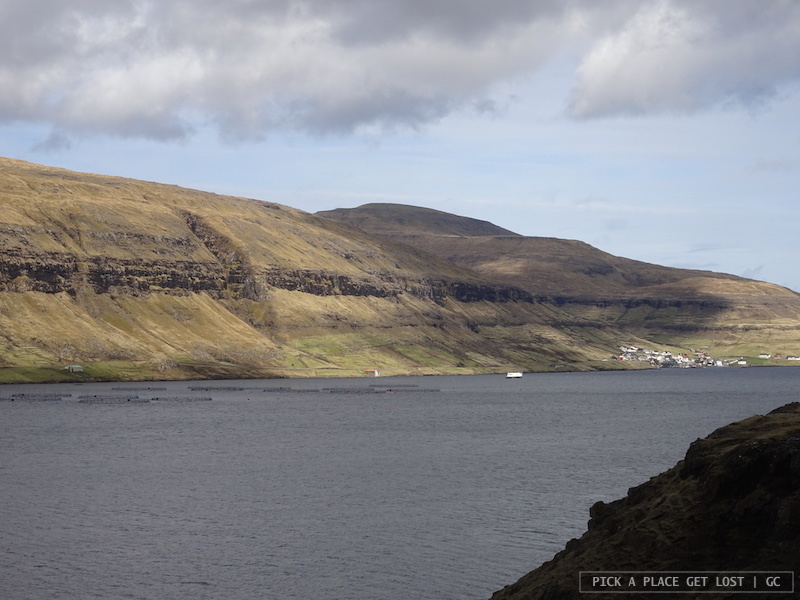 One of the main highlights and attractions of Gjógv is the location itself: a valley right next to a natural gorge (Gjógv itself means ‘cleft’ or ‘gorge’). The gorge, easily reachable by taking the road behind the guesthouse, looks like a deep incision that cut the rock in two. The 200-metre-long cleft in the middle forms a small natural harbour at the bottom, which you can reach by a concrete staircase just off the main road. 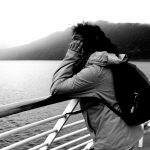 You might find the odd boat tied by the shore, though not that often: the strong winds or the rough sea might cause the boats to crash against the rock. Once you’ve reached the gorge, you also want to find the path right to the left of the staircase. 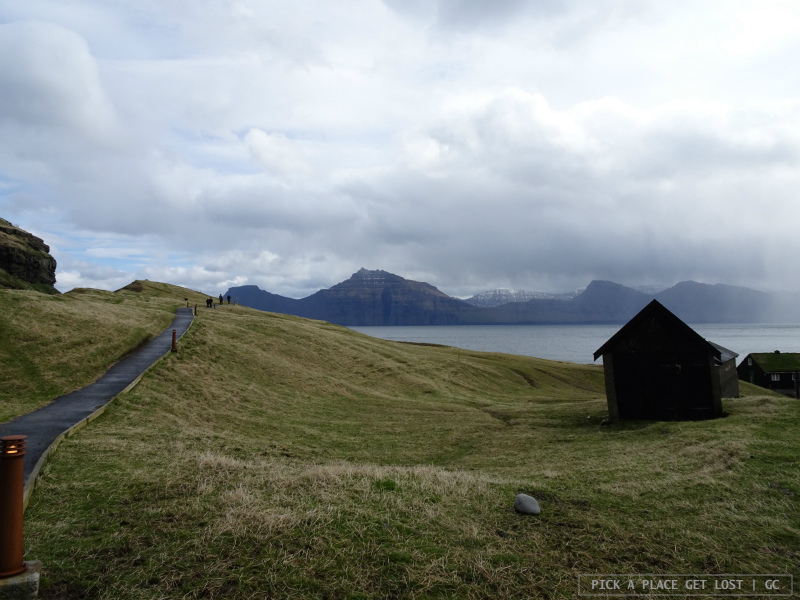 The trail follows the outline of the cleft, which, of course, rhymes with views of outstanding scenic beauty of the ocean, the mountain range and Gjógv itself. 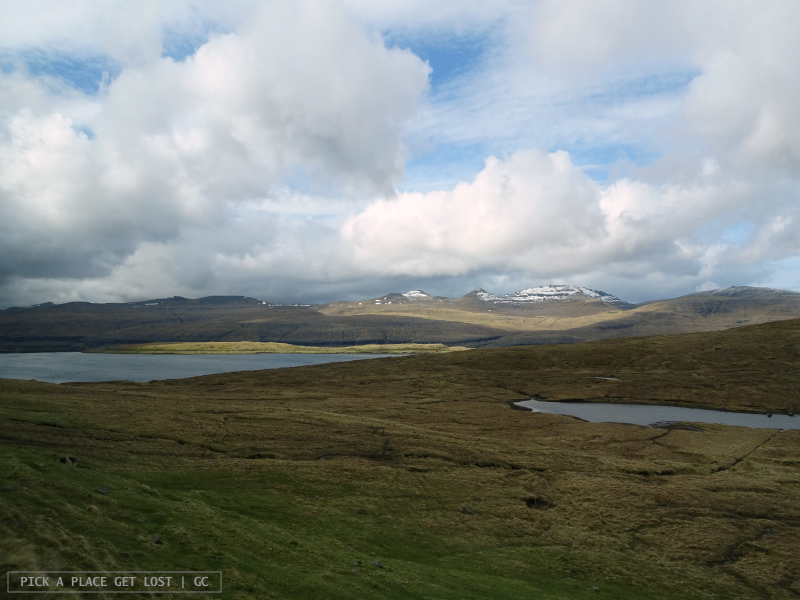 We had quite a tight schedule, so we couldn’t remain in Gjógv for too long. 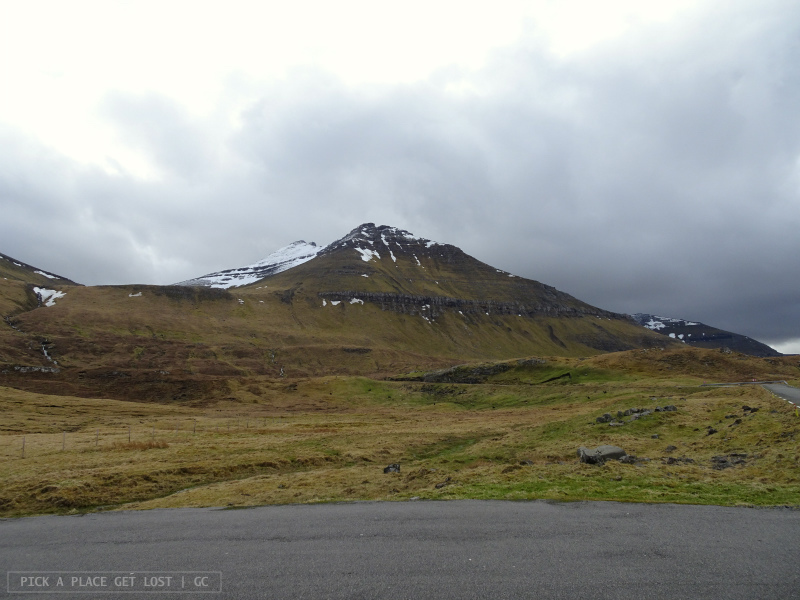 The drive back to Tórshavn was fairly straightforward but for two (very well-chosen) stops on Streymoy. One was by Kollafjørður, on the eastern coast, while the other was near Norðradalur, a small village on the western side. Both spots were unimaginably windy, but truly, mind-blowingly spectacular. The viewing spot near Norðradalur, on the road called Oyggjarvegur, was especially memorable. Also, it’s marked by a cairn, so you can’t miss it. 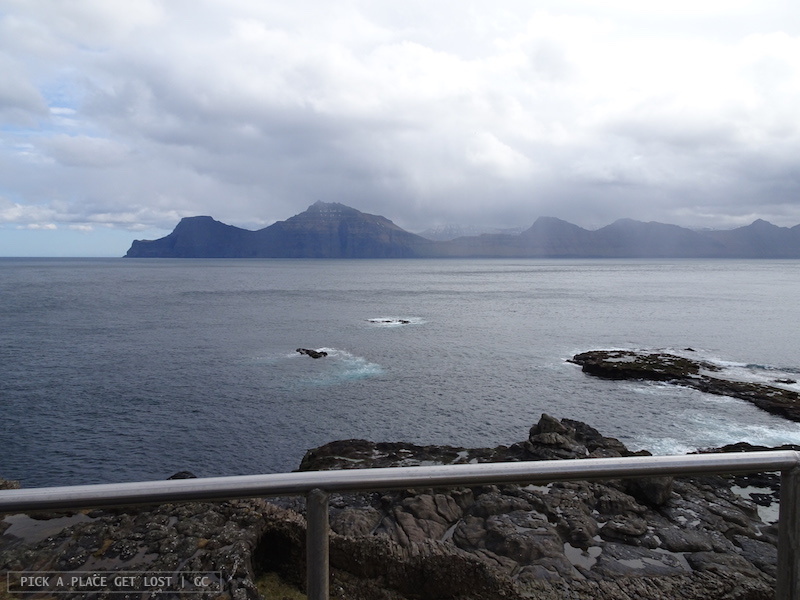 It offers sweeping views of the mountain slopes, the sea and, in the distance, Koltur island and tiny Trøllhøvdi (whose shape is kind of similar to Koltur’s, so it looks like a kind of projection of a small-scale Koltur in the background). Apparently we were very lucky with the weather: if only it had been cloudy or misty, it would have been impossible to see the islands. 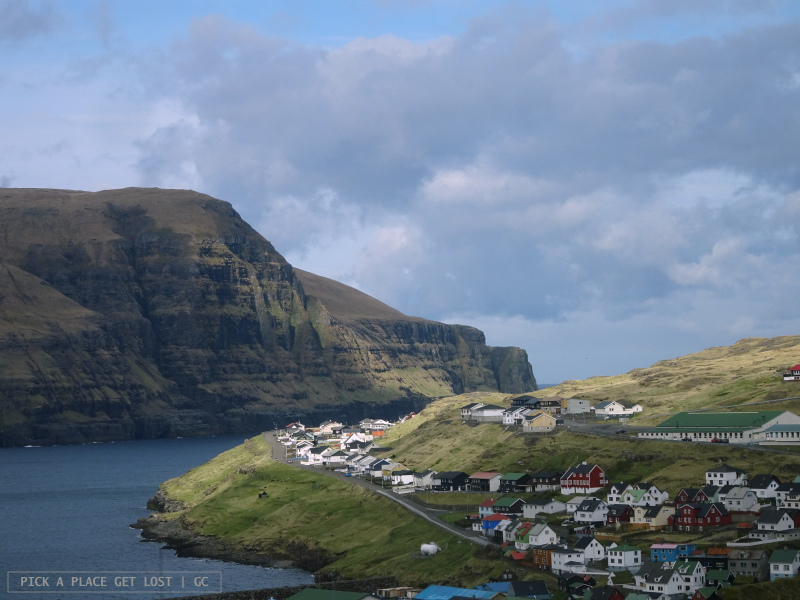 If all of the above doesn’t make you want to include Gjógv in your hypothetical (or actual) list of things to do in the Faroes (and not because I, of all people, wrote about it, but because of the place itself), well… No, I really don’t believe that’s an option to even contemplate! Back in Tórshavn, we were ready to explore the capital. But let’s talk about it in a brand new post, shall we? * A special thank you to 62°N Travel, who organised the trip, and to our one and only guide Dani for all the fun facts, bits of history (national and personal) delivered along the way, and for the couple of extra viewing spots picked along the way. He surely contributed to making it all even more special! 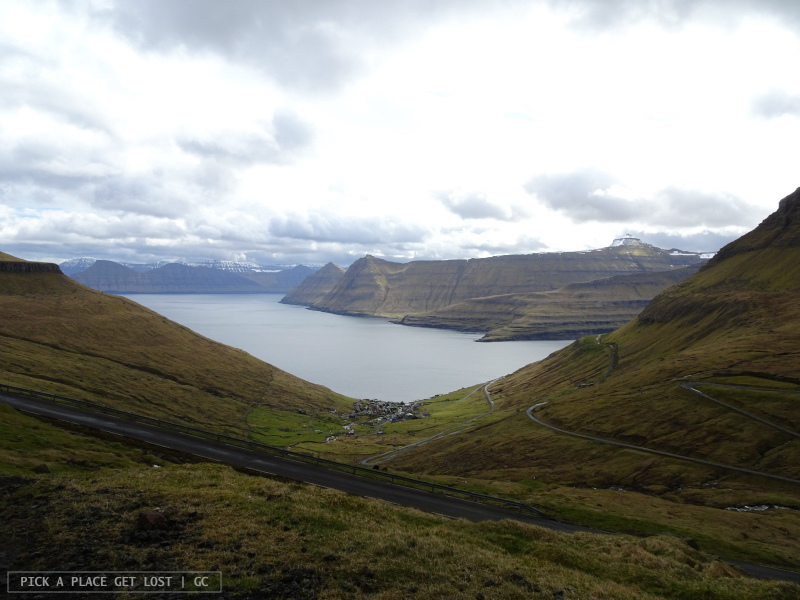 This entry was posted in Faroe Islands and tagged eysturoy, faroe islands, gjogv, road trip by Giorgia. Bookmark the permalink. I love this post – wonderful pictures. The Faroe islands are just amazing place, definitely on my bucket list.